Dice the onion very small and cook on medium in a little butter or olive oil for about 25 minutes until very browned. Put the ricotta and milk into a stand mixer or food processor and beat or mix until smooth and light and airy. Stir in the onion, paprika, and oregano. Place in a piping bag in the fridge until ready to use. Pack the Parmesan into tightly packed, very overflowing, tablespoons and place onto a baking sheet lined with parchment. Do two batches of 6 each. Bake at 400°F for about 5 minutes until slightly browned and bubbly. Remove from oven and, working quickly, mold the baked cheese round over the handle of a wooden spoon to form tubes. The cheese hardens very quickly so it's a good idea to have another person help with this step. Pipe the filling mixture into the shells and serve right away. Parmesan cheese bakes up into crispy little shells that hold cheesy caramelized onion filling. Yes, we did. Once I figured out how to make crackers out of cheese, I knew the possibilities were endless. Let's be clear – the crackers are made from cheese and only cheese! 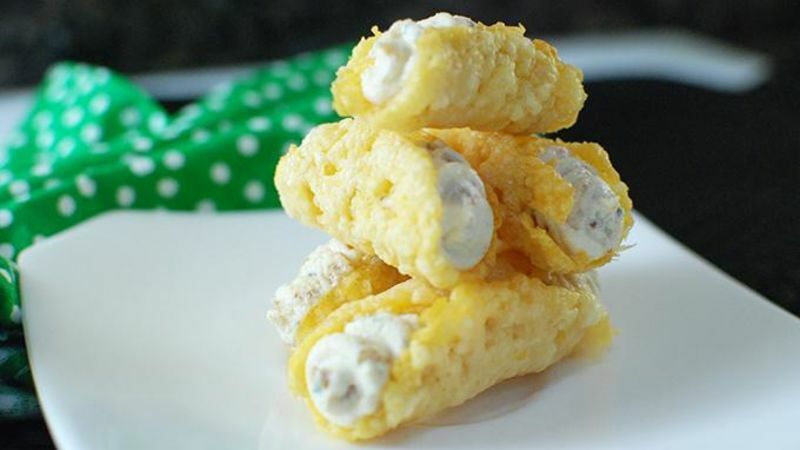 Just put it onto a baking sheet, pop it into the oven, and 5 minutes later you have crisp little crackers that you can mold into any shape you want. I thought these little Parm crisps would be perfect for an appetizer that was a fun and savory twist on cannoli, the Italian dessert. So I filled them up with a whipped ricotta that was loaded with caramelized onions to make a little two-bite app that was packed with deep flavors. Step one is to get the the onions caramelizing because that takes a while. Make sure you let them get nice and browned. Whip up the ricotta in a mixer or food processor. Then just fold in oregano, paprika, and the onions. The Parm crisps are easy to make – just put mounds of Parm onto a baking sheet and cook about 5 minutes. When they come out of the oven, make sure to form them quick because they harden fast. Use the handle of a wooden spoon as a mold and have a friend around to help do them all before they crisp up. Then just pipe the filling into the shells and serve! These are creamy, crispy, and full of deep flavors. Dan Whalen needs to figure out a reason to have a party now. He has been blogging for over 5 years at The Food in My Beard. Check Dan's Tablespoon profile often to try his recipes with creative international spins!